The Pittsburgh Penguins preseason has been an opportunity to “take the pulse” of how the goaltending depth of the franchise is doing. Entrenched as the starter is once again Marc-Andre Fleury. The flexible French Canadian is coming off a fantastic season where he carried an injured team on his back for long stretches of games. An 11-year veteran, Fleury will be 31 this coming November. While he’s not ready to be put out to pasture by any means, it’s important that the team manage his games played over the course of a season, so as to not burn him out come the playoffs. Currently sitting in the number 2 spot is Jeff Zatkoff. Zatkoff previously served as Fleury’s backup while Tomas Vokoun was recovering from blood clots, but played in the AHL last season due to the presence of Thomas Greiss on the roster. Now that Greiss is gone, Zatkoff is the favorite to claim the backup job. Zatkoff has led the team in goaltending minutes this preseason, posting 2 games started and 98:22 total minutes on the ice. In that time, he has made 48 saves for a .923 SV%. An impressive statistic, but his 0-1 record isn’t. Granted it’s preseason, and the team playing in front of Zatkoff is working on their own issues, but this shows Zatkoff is ready for when the team in front of him is ready. 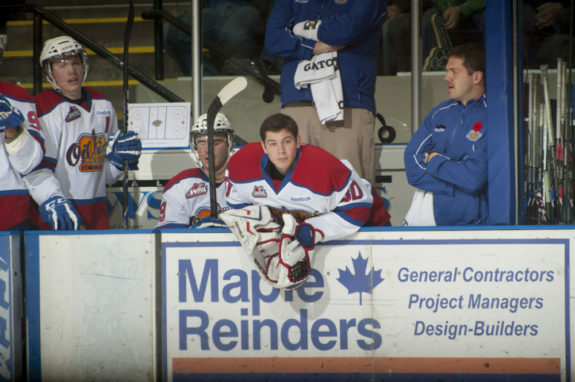 Tristan Jarry, who currently resides 4th on the franchise’s depth chart, appeared in only one game so far. He was on the ice for 25 minutes, making all 7 of his save opportunities and earned a win. This preseason was supposed to be a showcase for Matt Murray, who had a stellar season last year in Wilkes-Barre where he went 25-10-3 in 40 appearances. His save percentage of .941 was stellar, as was his 1.58 goals against average. His 12 shutouts were more than Fleury’s 10, albeit against AHL competition. He’s expected to challenge Zatkoff for the backup job, if not this season, then next. As for this preseason, Murray has struggled. He’s played 78 minutes over 2 games, one of which he started. His 4.62 GAA and .818 SV% are unsurprising for someone getting his first real look at NHL caliber shooters, but the shine of last season will take more than a slow start to fade away. I fully expect Murray and Jarry to form a formidable combo in Wilkes-Barre this season, as they both continue to refine their games. Zatkoff, who is on a 1-year deal for 600k, is no guarantee to return after this year. If he does a great job backing up Fleury, he could work that into a better offer elsewhere. If he plays poorly, he might be overtaken by the youth movement. Zatkoff “holding down the fort” until Murray or Jarry is ready is the probable plan. Until then, Fleury is going to be counted on to once again carry the load for the Pens.